Reichheld introduced the concept of the Net Promoter Score (NPS) in his article titled “The One Number You Need to Grow” published in the Harvard Business Review’s December 2003 edition as a simple and profound measure of brand health. A top notch and experienced expert in the domain of loyalty, Reichheld used his research and experience at Bain & Company to devise NPS and propose why it is important to track. Ever since, net promoter score measures have become a de-facto standard to measure brand health. There have been criticisms (Grisaffe, 2007) about the approach and whether NPS is the one and only metric to rely on. However, the consensus view is that NPS is an important measure if not the only one. In this blog post we discuss in detail about the net promoter score and explain how to measure and interpret NPS. We take the argument a step further and explain why a real time NPS measurement can be powerful. Net Promoter Score is a summary measure of a brand’s health. The score encapsulates the growth prospect of a brand. The NPS measure is premised on an assumption – that the growth of a brand is driven by enthusiastic advocates who actively ‘promote’ the brand. Also, it assumes that the growth of the brand is de-accelerated by its detractors. The net percentage, i.e., the percentage of promoters minus the percentage of detractors is what gives us the net promoter score. The definition is of course more precise. Responses are collected from consumers post consumption of service to determine whether a consumer would recommend the product/service on a scale of 0 to 10. Those who respond with an 9-10 are considered promoters while those who respond with any score equal to or below 6 are considered detractors. The remaining are categorized as “passive” – the silent audience. Typically, passives would constitute the majority and the difference between those actively advocating or discouraging use of the product or service becomes the “net” favorable voice. A positive measure of NPS signifies that there are more advocates than detractors and therefore the brand would grow. Studies have shown that NPS correlates well with customer retention. 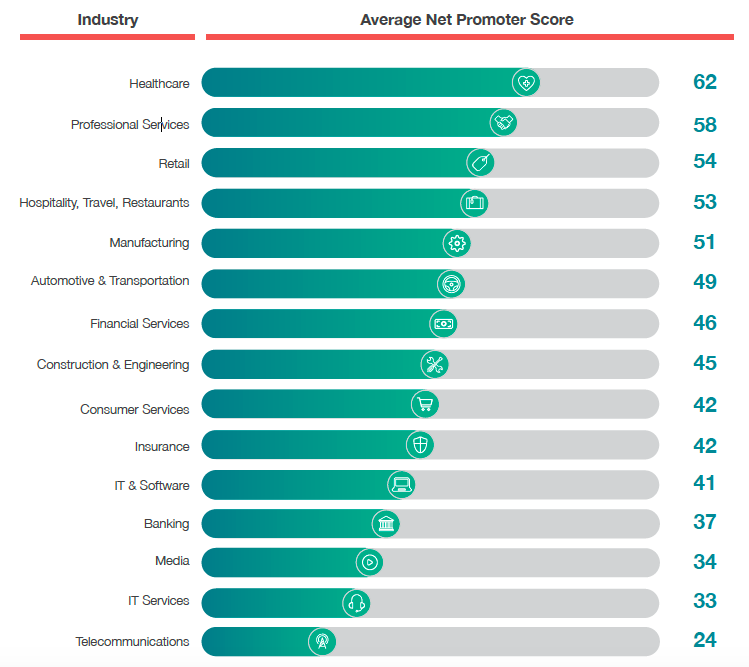 What does the Net Promoter Score signify? By definition, the NPS can range from -100% to +100%. Let us understand this better. Think about iconic brands such as Apple (in the 2000s) or Disney, where almost all consumers of the brands were advocates and there were hardly any detractors, the NPS measure would be near 100%. Near 100% scores imply that the brand has almost a cult-like following. Consider the case of a movie which bombed at the box office. If the audience of such a movie vociferously advice others against going for the show, the resultant NPS could be near -100%. With a high negative score, the viewership of such a movie would decline exponentially over the next few days resulting in poor returns. A positive NPS score is considered good. How is information gathered to compute the NPS? The NPS scores are collected by prompting the consumers to fill out a questionnaire. Typically, the question can be part of a larger set of questions and is administered through physical forms, or digitally through online surveys or IVR (Interactive Voice Response). Apps have an in-app feedback survey which can also have NPS related questions. The best practice is to get the feedback right after the customer has engaged or experienced the brand. For example, you get asked a few questions by airlines right after your air travel. The recency helps consumers provide relevant responses since the experience is still fresh in their minds. The best practice on implementing NPS measurement is through use of automation, which ensures that the questionnaire is administered at the right time and considers the context of the consumer. NPS score distributions or central tendency measures such as mean and median NPS scores can give an idea of how the NPS is distributed amongst the sample who responded to the questions. This aggregate measure helps estimate the growth and customer retention metrics. What are NPS scores for some of the popular brands? Amongst the popular brands the ones with high NPS scores are Tesla (96), Apple (72), BMW (72), Netflix (68), Amazon.com (62). The over 90 NPS depicts the cult like following that Tesla enjoys today. Well-known brands with a low NPS score include McDonalds (-8), Comcast (-5) and Baidu (0). More comprehensive reports available online provide NPS scores for popular brands across industries. What are industry NPS benchmarks? CustomerGauge published its 2018 NPS & CX (customer experience) benchmark report, a study based on responses from over 400 respondents across several countries. A snapshot of the industry benchmarks is shown in the figure below. Online, real time NPS – the ultimate brand health metric. Even the most comprehensive NPS studies are marred by limited sample size. It is difficult to get responses to questionnaires through intrusive email/SMS based NPS administration. Getting survey responses in physical paper forms is tedious, especially when collected from different regions and cities. Auris advocates making use of the opinions shared by detractors, passive customers as well advocates online – on social, review boards and blogs. The sample size is much larger, the responses are what consumers have expressed of their own volition and all of this in real time. Not to mention the fact that such NPS measurements cost a fraction of what the conventional methodology costs. True representation of brand health as on date: NPS measurements over a year or two prior might not be representative of the true voice of the customer. For example, the NPS for the iPhone is very different in 2019 versus 2016. Real time helps the brand teams understand the changing preference of the customers. Responsiveness: More frequent the measures, more responsive the brand. Real time implies a continuous measure, which is the holy grail. This helps the brand understand dips, get to the root cause and address the issues immediately. It is a well-known fact that improved responsiveness in fact helps improve NPS in the longer term. Implementing a real time NPS can help brands make this feedback measure become more robust (through a large sample size), reduce bias (by using unprompted views) and significantly reduce the cost.